Find five mouthwatering Beanfields Bean & Rice Chips flavors at 25 Target stores in the Los Angeles area. At Beanfields, we strive to create the most delicious, innovative tortilla chips packed with nutrition. Our Beanfields family was honored to be chosen as one of the select brands to participate in the LA25 program. Beanfields, makers of the award-winning Beanfields Bean & Rice Chips, was chosen as one of the select brands for Target’s LA25 initiative. The Target stores participating in the LA25 program now carry five flavors of Beanfields Bean & Rice Chips: Sea Salt, Nacho, Pico de Gallo, Ranch and Salt & Pepper. The LA25 initiative is taking place in 25 Target stores in the Los Angeles area. The 25 stores include Long Beach- Bellflower, Culver City, Manhattan Beach, Torrance, Westminster, Valencia, Aliso Viejo, Woodland Hills, North Hollywood, Irvine, Anaheim Hills, Pasadena, Rancho Santa Margarita, West Covina, Seal Beach, Pasadena East, Norwalk, West Hollywood, Redondo Beach, Whittier, Tustin, Carson, San Pedro, Brea, Woodland Hills and Culver City South. At these stores, Target is testing about 50 of its top enhancements and innovations to study the power they have on guest experience and sales. Target is working to localize the store experience for its guests by integrating approximately 20 local Los Angeles vendors into select stores. Beanfields Bean & Rice Chips resonates with the Los Angeles-area guest who is health conscious, socially conscious and is tuned into food innovation. Beanfields Snacks are delicious, better-for-your tortilla chips made with an artisan blend of beans and whole grain brown rice. 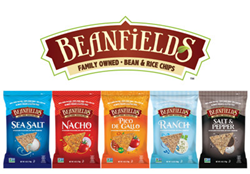 Beanfields Chips are always vegan, gluten-free, Non-GMO Project Verified, kosher, and allergy-friendly - all while offering great taste and exciting flavors that compete with conventional snack brands. Beanfields PBC, makers of Beanfields Bean and Rice Chips, is a family-owned Public Benefit Corporation and a Certified B Corp. Beanfields Bean and Rice Chips indulge your taste buds with every delicious crunch with ten tempting flavors: Sea Salt, Nacho, Pico de Gallo, Jalapeño Nacho, Black Bean with Sea Salt, White Bean with Sea Salt, Barbecue, Ranch, Salt & Pepper, and Simply Unsalted. Beanfields Bean and Rice Chips can now be found in all 50 states and internationally in Canada, Australia, the United Kingdom and other countries.